Our Competitive Teams are for the Athlete who has decided she wishes to be more serious about the sport of gymnastics and is therefore willing to commit more hours to training in the gym and to attend competitive meets throughout the season. These meets might require extensive travel, overnight stays, and higher tuition fees than recreational gymnastics. Athletes on our competitive teams are expected to attend all scheduled practices and competitions. Any time a practice will be missed, the coach must be informed ahead of time. All meets are mandatory for the competitive athlete unless the athlete is medically unable or the absence has been excused by the head coach. We average 5-6 meets plus State Championships, Regionals and beyond for the higher levels. It is a requirement that all families considering to participate on a team read and understand the "Team Handbook" and print out and sign the "Acknowledgement Form." Team gymnastics requires a “family” commitment and please understand that your commitment is renewable from year to year. If you are considering joining one of Haydens teams please contact us at haydens@haydensgym.com to arrange a meeting. Level 3-5 are considered “compulsory” levels, meaning that all gymnasts in the USAG program will perform the same routine to the same music as every other gymnast in competition as authorized by USAG and Region 8. The athletes will receive individual and team scores that will be posted and awarded according to their performance. Along with the increase of time spent in the gym, the girls will begin to work on higher-level skills. Level 4 girls continue to compete at USA Gymnastics sanctioned meets within Region. They will be officially scored and receive placements and team awards based on their performance. 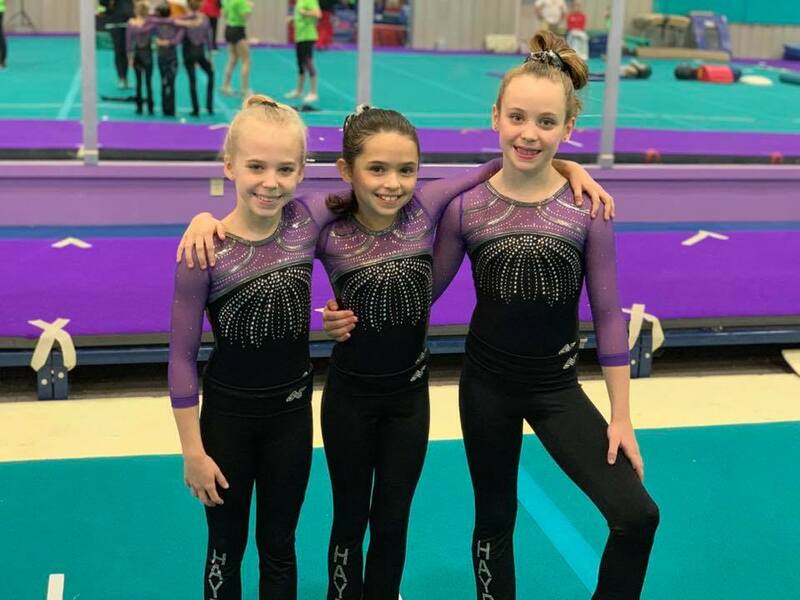 Level 5 girls continue to compete at USA Gymnastics sanctioned meets within Region. They will be officially scored and receive placements and team awards based on their performance. Levels 6-10 are considered “optional” levels. Optional levels are slightly similar to compulsory levels in that every gymnast in the USAG program will still compete according to the same rules and requirements set-up by USAG. However, in the “optional” levels, the routines are individualized according to the athlete’s strengths. Optional gymnasts will have their own routines, distinctively choreographed, using their own music and personal style. Level 6 is the first level where they are considered an “optional” gymnast. The athletes will complete at the State Meet at the end of the season. The Optional level is where the athletes’ hard work really starts to pay off. They really come into themselves as an athlete, gymnast, and a person! Athletes in Level 8 will continue in the same structure as Level 6/7, with the exception of increased expectations, conditioning, and skills. Level 9 and 10 are the highest levels of the Junior Olympic USA Gymnastics program. These athletes have the opportunity to qualify for State, Regional & National Competitions. Qualifying to Nationals is a high honor in the sport of gymnastics and offers exposure to college scouts. It is at these levels that the girls start thinking towards their future careers and college scholarships. To be a Level 9 and 10 gymnast is an honor in itself, as these athletes must train exceptionally hard to achieve this level.